Today I practised for the 27th day in a row. I’m not saying this to show off, or to make you feel bad that perhaps you haven’t, I want to show you how doable it has been, discuss some of the methods I have used and the explore the results. A while back I admitted that I was working on a big project and I needed to get into musical shape. This has been my intention for a long time and after a fair amount of procrastination, I bit the bullet and got a gig booked in. This leap of faith was exactly what I needed and it has stoked the fire in my belly. In this post I want to show you how to be more productive and perhaps motivate you to do something similar. Find a deadline and plan backwards from it. For me it was book a gig on saxophone and write completely original music. I have a date for this and in order for me to be on track I need to get in shape for it. Now, if you do it the other way round and think “right, I need to prepare for a gig on saxophone” then the chances are: you will never be ready and it will never be ‘good enough’. By working backwards I know that I’ve worked hard and I’m the best I can be at that point in time. It just feels better this way. I tend to get sucked into the geekiness of new tech and I’m keen to use software to enhance my life rather than detract from productivity. 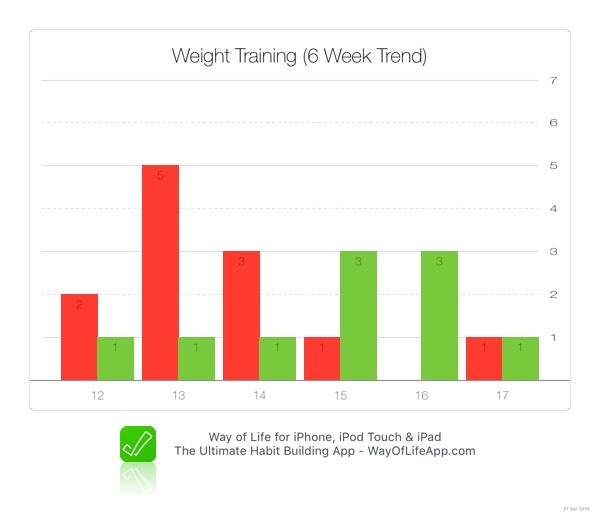 This simple app is a really useful way to track progress of daily habits. It’s a modern version of the Seinfeld ‘don’t break the chain’ method which I stumbled upon a few years back. He used to write sketches everyday and keep track by placing a big red cross on a calendar. The act of placing the cross and seeing the unbroken run of productive days was incentive enough to keep going. I tried this with my calendar at home with yellow stickers until I ran out of yellow stickers and kept forgetting to buy more! An app on my phone works better for me. 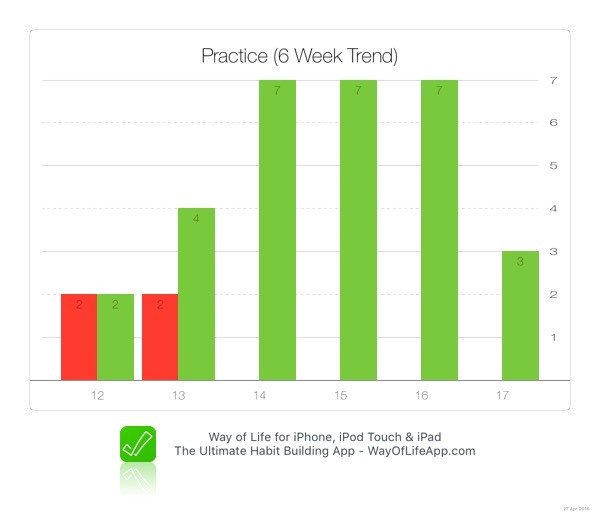 Here you can see the three habits I’ve been tracking over the last 6 weeks. 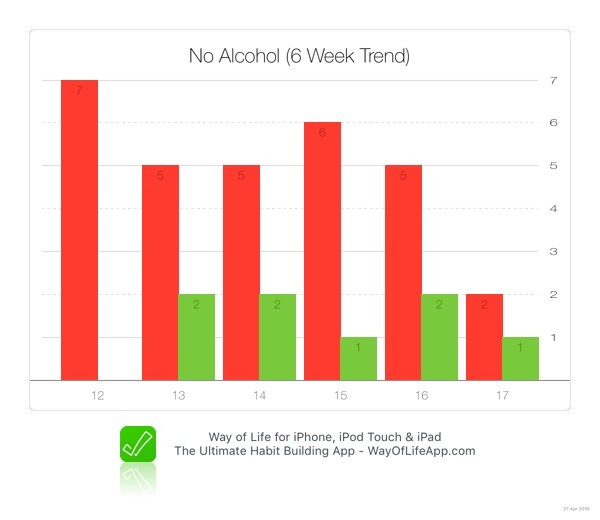 The practice has had a continuous run, exercising has been relatively consistent whereas the alcohol free days hasn’t been as successful! I’ve been practicing everyday but I haven’t had time to dedicate huge chunks of my day. So how much time is good enough? Well, I consider 25 mins to be the minimum for where I want to be. It’s also a great amount of time to keep focus. I use the pomodoro technique and break my session up into small sections of no longer than 25 mins. I have been doing a 5 minute warmup which as mentioned in a previous post, is not only a warmup and entry into the real meat and potatoes of my session, but a meditation where I can ground myself. This has massively helped to gain focus for the main practice and also helped to switch my mind from the day to day tasks of working, vacuuming the carpets and dressing up as Iron Man for my kids. I use a metronome which happens to have a built in practice timer. I set the metronome at 60bpm and the timer for 5 mins at first then 20 (unfortunately it only has settings for 20 or 30 mins intervals – 25 would be better). This not only forces me to work hard for that period but at the end I drop everything (even if I’m in the middle of an exercise) and this seems to help with motivation. I like knowing when I can stop! If I do longer than 25 mins then I usually do another 25 mins or occasionally 3 X 25 mins. I have a series of targets when I practice and I’m lucky in that I know the best ways to achieve them. I rotate exercises to keep things fresh but work on these main issues. Lately they have been: tone, technique, intonation (particularly at the top)’ altissimo fingerings (I can never remember them all), patterns (a bit of a new venture for me and I’m testing some ideas), transcribing and learning tunes. Each day is different but I usually choose my task on the day depending on what I feel like working on (or which task I have neglected for too long). I like to end my practice unfinished so when the timer goes off, I stop. I am left with a feeling of “I was into it, and I could have done more”. This motivating feeling then transfers to the next day. It’s a bit like writing a story and finishing the day mid sentence. It should spark creativity when you pick it back up rather than being left with writers block. Not a recommended method for sufferers of OCD but it works very well for me. I document all my progress in an exercise book. 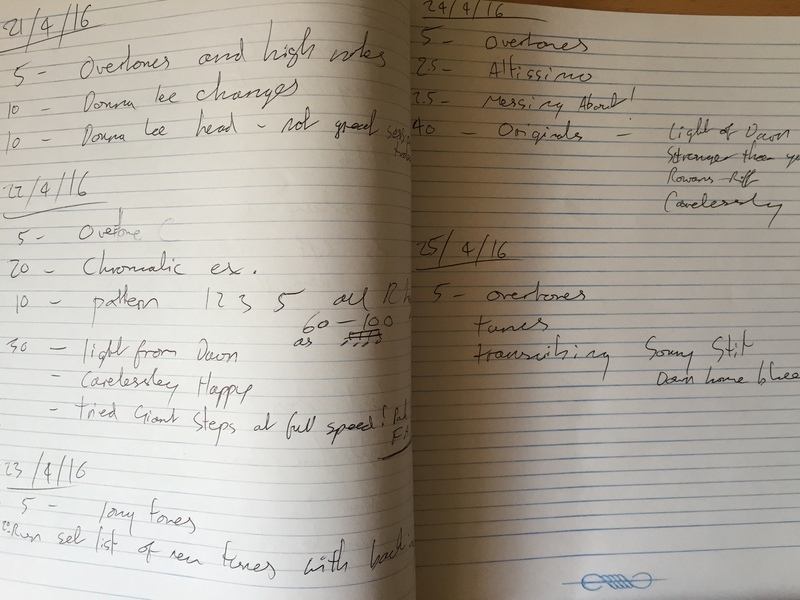 I like the sense of achievement gained by filling a workbook with notes and accomplishments. I rarely read through it afterwards but the act of physically writing what I did in the session acts a short debrief. I can use this to ‘check in’ on a task, monitor progress or to make sure I’m not over developing one area of focus. As most of my students know, I am really bad at keeping house plants. 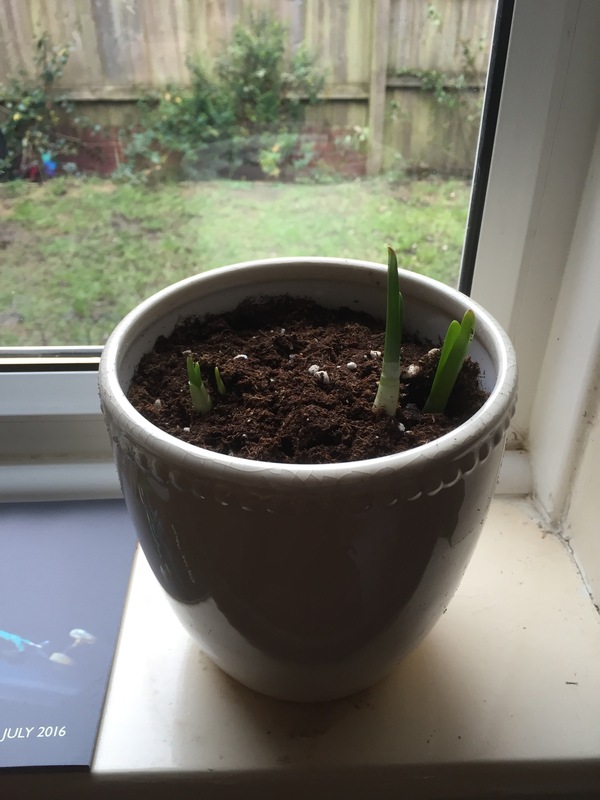 I planted bulbs and have been using the practice to remind me to take care of them in the hope that I will take care of the plant and it will remind me to practice! The guilt has gone - A lot of musicians face this problem. They feel this constant state of guilt that they are not dedicating time to their craft. By practising everyday I’ve realised that this feeling has all but gone and I feel lighter! 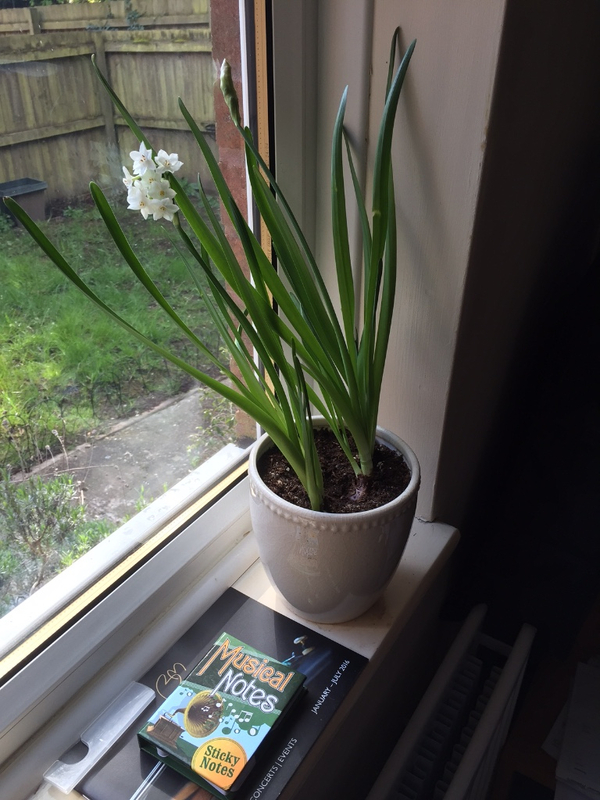 Plus I haven’t had to throw yet another potted plant in the bin!